Given the physical nature of stained glass windows within churches and public buildings (comparatively large and often very high) they are generally subject to the build up of decades (and in come cases centuries) of dust, dirt and debris. Alongside our restoration, conservation, design, production, installation and protection services, Lightworks also offer a professional glass cleaning service. This can literally breathe new life into the glass with colours becoming richer, brighter and more vibrant and in the case of less heavily painted (or un-painted/clear) glass, optical clarity and light transmission can be greatly improved. All glass cleaning by Lightworks is undertaken in line with current best conservation practice; loose dust and debris is carefully removed using soft dry brushes before more heavily ingrained deposits are removed with the use of lint free cotton cloths and de-ionized water. Under no circumstances should household cleaning products or chemicals be used on painted (stained) glass. 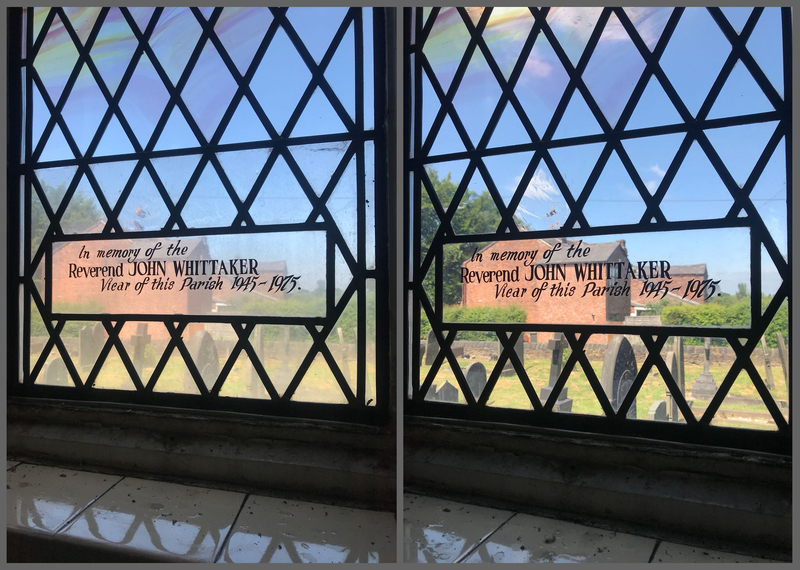 Our image shows before and after cleaning shots of part of a late period 20th Century stained glass window at Coppull Parish Church.Here you can clearly see increased optical clarity; the glass appearing almost etched within the left hand image pre-cleaning, revealing a greatly improved view onto the outside world in the right image post-cleaning. This work was undertaken recently as part of a full internal glass cleaning programme, including all 12 twin lancet nave windows.